Whether this March the leaves are falling or only starting to grow, new books in translation continue to push through borders and languages. 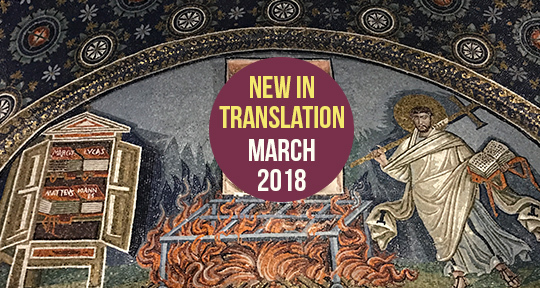 This month, our editors review new translations from Germany and Lebanon, whose stories span diverse regions and explore complex notions of belonging. “It happened or maybe no. For twenty years, in the midst of Lebanon’s civil war that lasted from 1975 until 1990, the traveling theater company Sandouk el Fergeh (the Box of Wonders) traversed the Levant searching for inspiration for their live shows. The actors and their marionettes would travel from shelters to refugee camps, villages to towns, performing the oral tales painstakingly collected by their founder Najla Jraissaty Khoury. It was no small feat trying to find and record stories during wartime when suspicion and fear were particularly acute, not to mention the difficulty in assembling complete narratives from a depleting cache of collective cultural memory. Oral tales are one of the most fragile cultural legacies, and too often die with their storytellers. So, what happens to the oral history of a region suffering through war and displacement? That’s what Khoury hoped to find out, and the question is what inspired her to embark on a rescue mission in search of these unwritten remnants of Lebanese, Syrian, and Palestinian culture. She collected dozens of folktales, writing them down exactly as they were told (repetitive phrases and all), culled one hundred from that catalog, and published them in Arabic. 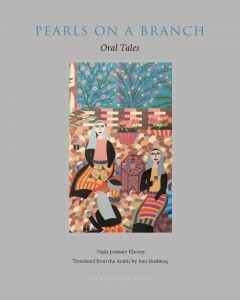 English speakers now have the opportunity to read a selection of thirty stories in Pearls on a Branch.